We’re heading way back into the depths of home computer history today – or perhaps that should be school computer history? - with a look at a game that’s even older than I am. 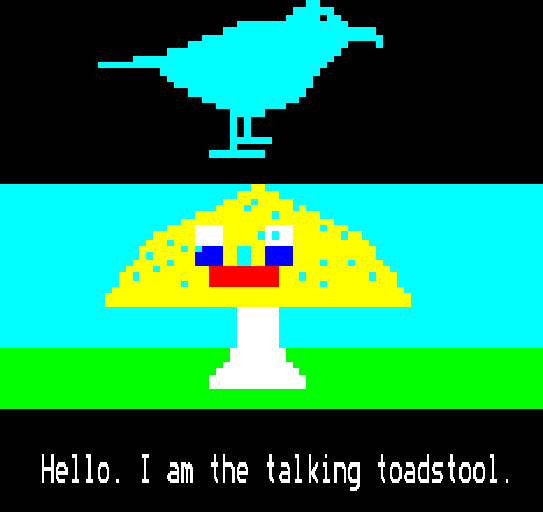 Take out your pencil case and say “here!” when your name is called, because it’s time for 4mation’s 1983 BBC Micro educate-em-up Granny’s Garden! Things that don’t really feature in Granny’s Garden: grannies, gardens. They really should have called it Witch’s Woodland, as we shall see, but first let’s have a brief history lesson. Way back at the start of the 1980s, the idea of a regular (albeit wealthy) person owning a home computer was just about becoming a reality. In their finest traditions of education and public betterment, (and possibly to compete with ITV for viewers,) the British Broadcasting Corporation decided to embark on something called the Computer Literacy Project. This was a multimedia project including books and television shows aimed at explaining the concepts and potential of home computers to the British public. There was one extra component: the BBC wanted their very own home computer to tie in with the project. Several computer manufacturers of the time submitted their designs, but in the end the winner was Acorn Computers and thus the BBC Micro was born. 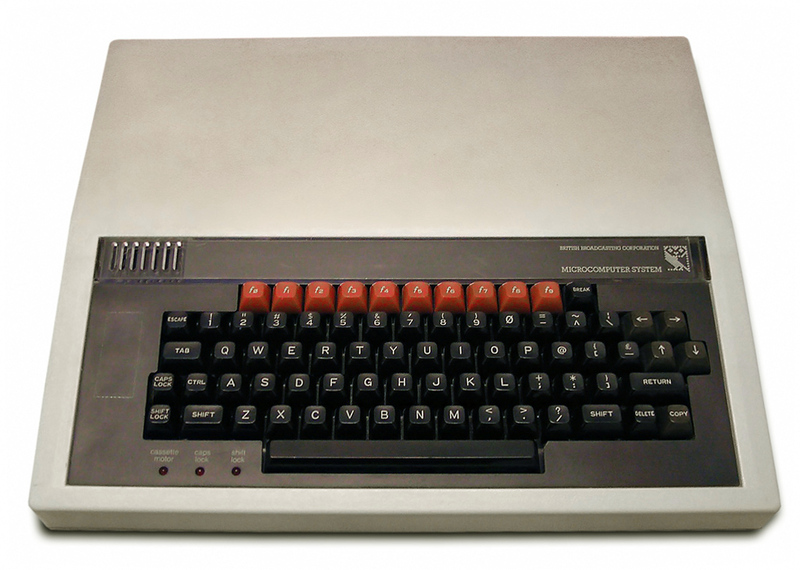 “BBC Micro” actually refers to a number of models and revisions of Acorn’s computer, but they’re all pretty similar. Now, the BBC Micro might mean little to anyone from outside the UK, but if you’re a British person in your thirties or forties there’s a bloody good chance that the BBC Micro was the first computer you ever used. They were hugely popular in schools, with a generation of schoolkids getting their first taste of typing, programming or playing computer games on one of these humble units. I certainly did, and I while my memory is a little hazy on the subject I’m pretty certain that the BBC Micro was the first computer keyboard I ever clacked away at because we had one in our classroom. Just seeing those bright red function keys is giving me the kind of nostalgia usually reserved for finding a childhood pet’s collar at the back of a forgotten drawer. 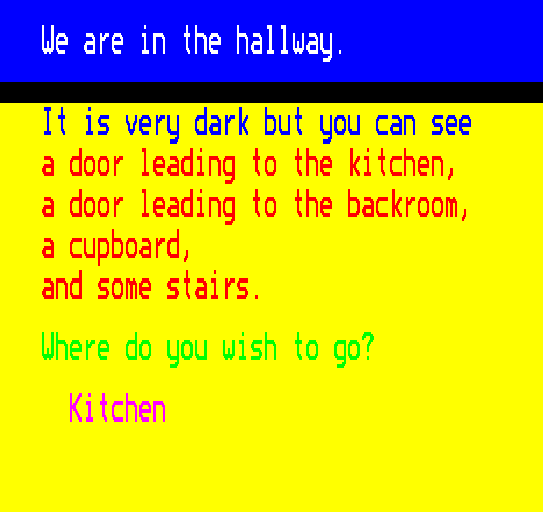 Which brings us to Granny’s Garden, an adventure game with educational leanings that many teachers credited with being the application that convinced them and others that computers could play a valuable role in educating children. 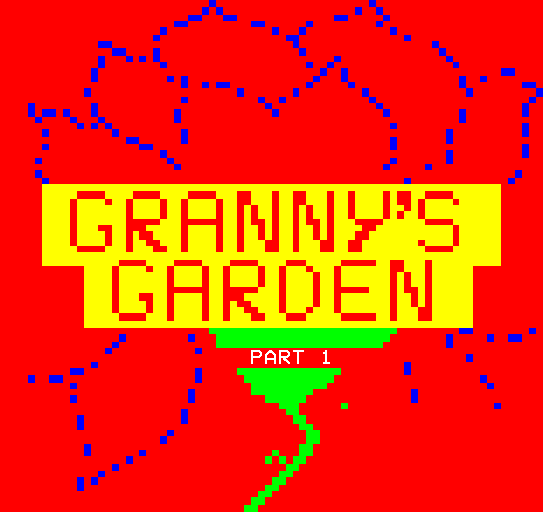 Granny’s Garden is almost as well-remembered as the BBC Micro itself… okay, so maybe “well” remembered isn’t the right phrase, because you see it pop up a lot on “I’m trying to remember the name of a game” threads and message boards. That’s hardly surprising; the combination of playing it a long time ago as a small child and the striking and often rather strange contents of the game mean it’s something that lives long in many people’s memories. 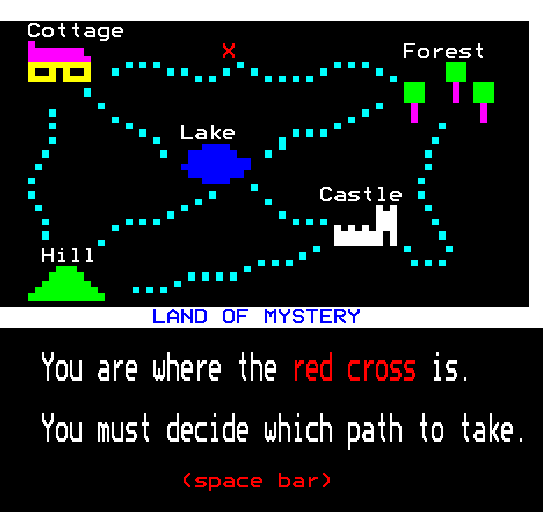 So, if you found this page by Googling “old British computer game with scary witch” then yes, you’re thinking of Granny’s Garden. The game begins, rather underwhelmingly, with a guessing game. 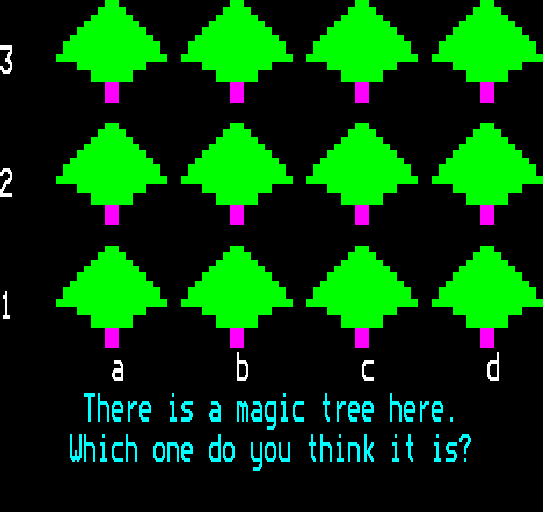 One of these identical trees is filled with magic. Simply type in the coordinates of a tree a la Battleship and hope you’ve guessed correctly. Is it boring? Yes. But is it also dull, pointless and unconnected to the rest of the game? Yes. That’s because we’re looking at it from the distant space year 2018, though. You’ve got to remember that this is before many people even knew what a computer was, so teaching very young kids that you can make letters and numbers appear on the screen by pressing the corresponding key is an important step. 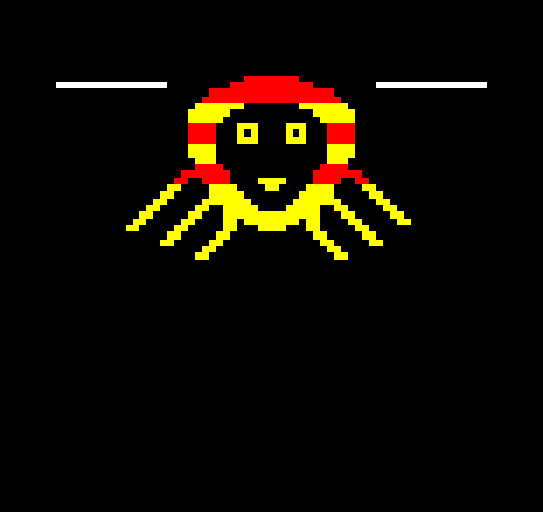 Now, I’m all for emulation and I’m happy to play games that way, but for once I’m disappointed that I don’t have a real BBC Micro sat here in front of me because I feel like I’m really missing out by not getting to press those big, chunky keys. 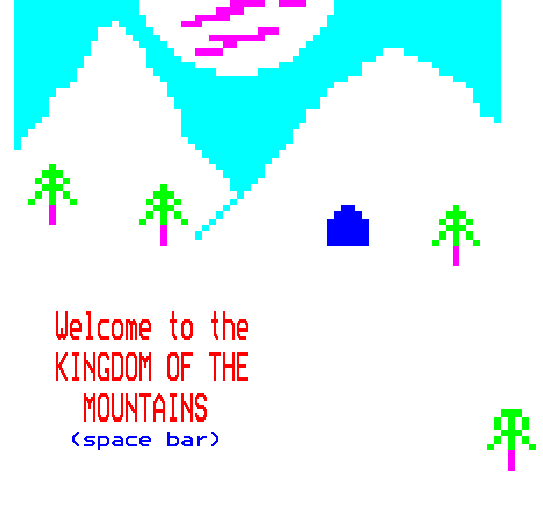 Okay, now we’re into the game proper, having arrived at the Kingdom of the Mountains. It’s a bleak and sparely-wooded land, gripped by permafrost and with only the ominous mouth of a distant cave offering any shelter from the elements. Unless granny lives on Hoth, I think we’re already well outside of her garden. 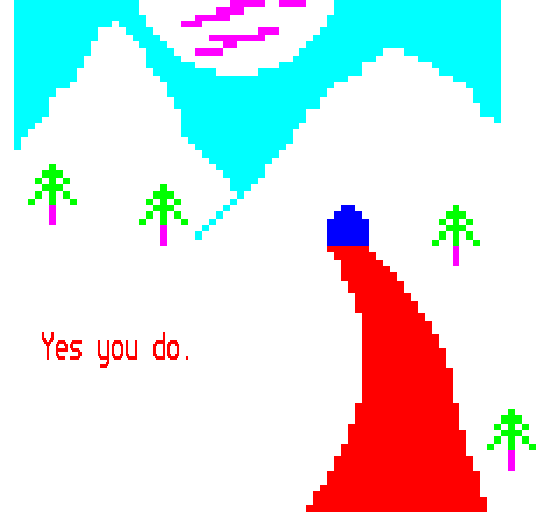 “Do you want to go in the cave?” it asks. Honestly? No. It looks spooky. I’d rather stay out here in the brisk winter air, enjoying the scent of the pines and trying to figure out what has caused those fissures to appear on the moon. A dread omen of impending disaster seems like a good bet, and if the unspeakable creatures that dwell beneath the lunar surface are about to break free then I think seeing that would be more educational than entering some random cave. So no, I don’t want to enter the cave. Or, you know, I do. That’s what the game’s telling me, and who am I to argue when the cave has rolled out the red carpet for me? At least I hope that’s carpet. Here the goal of Granny’s Garden is revealed: find the kidnapped children of the King and Queen. They’ve been locked away by an evil witch, so I don’t have long to find them all before she gets back from the shops with bags full of cakes and sweets to start fattening them up. I mean, if you’re going into the child cannibalism business then the tender, pampered flesh of the aristocracy would be a good place to start. The game also asked me if I wanted to help the King and Queen. Naturally I said no. Until Lizzie II leads an army into battle wearing full plate armour and setting her lethal attack corgis on her enemies, I shall never respect the monarchy. The game did not accept my refusal, simply saying “That’s not very nice!” until I acquiesced. Not really having a choice is a running theme with Granny’s Garden. I was going to say that teaching kids they have no real choices in the face of the monolithic power structures that rule their lives was a valuable lesson for children to learn early on, but I think that might be a bit dark even for me. 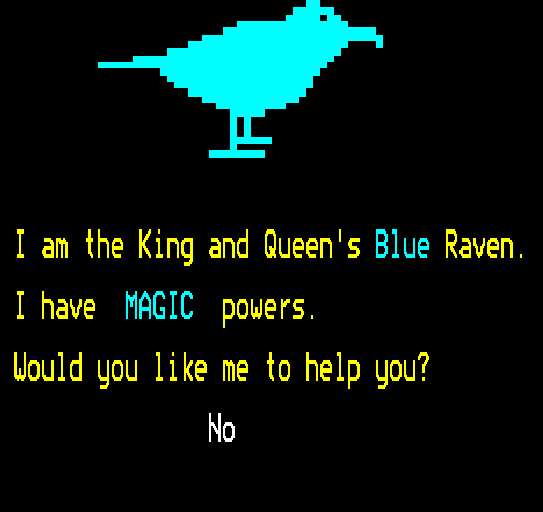 I couldn’t even decline the help of the King and Queen’s magic blue raven. It’s a design that smacks of the developers deciding that they were going to use a raven before they realised the game takes place on predominantly black backgrounds. They raven says he’s going to fly you to the woodcutter’s house, where the first child is imprisoned. You cannot refuse the raven’s offer. Here we go, a bit of educational gameplay. What secret word is hidden on the outside of the woodcutter’s house? Hidden might be a bit of strong word, there. I’d remind you that Granny’s Garden was designed for very young children. 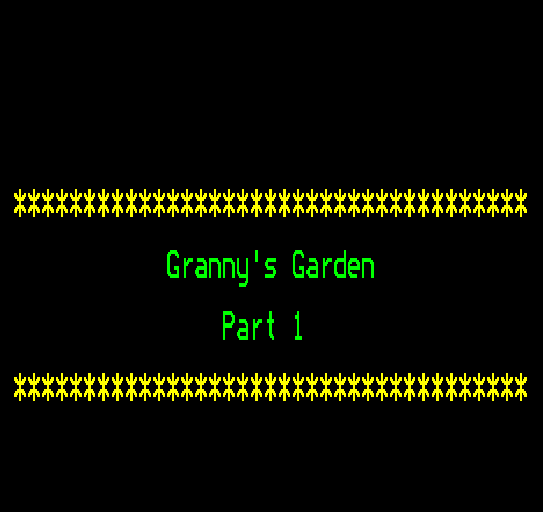 Once you’re inside, Granny’s Garden reveals itself to be a very lightweight, erm… I suppose it’s technically a graphic adventure but the graphics are minimal. 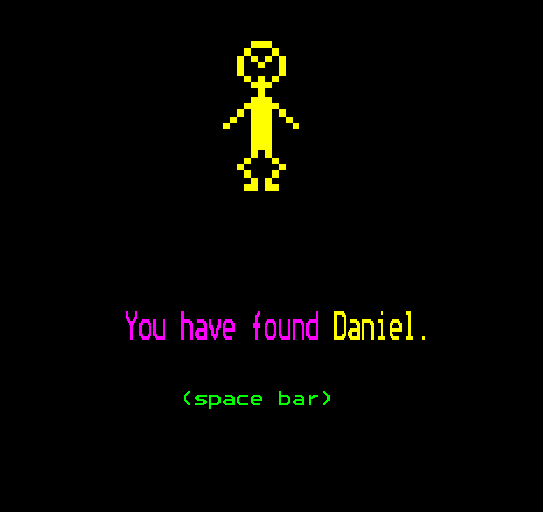 You type in commands to move around the house and solve a couple of “puzzles,” that kind of thing. I decided to check out the kitchen first – if you could see the elasticated waistband on the trousers I’m wearing right now that’d come as no surprise – but when I was in there I made the foolish error of looking into the witch’s cauldron. Here comes the witch to feast on your bones while rolling her eyes and gnashing her teeth like someone’s slipped her a dodgy pill at a rave. I know there are a lot of people out there who were traumatised by this four-colour monstrosity in their childhoods, and it’s not hard to see why. You’re playing what promises to be a colourful fairytale adventure when you look at the wrong cooking utensil and bam, here comes a nightmare whose traditionally witchy hooked nose and chin have become fully a snapping beak. What’s worse, meeting the witch sends you right back to the start of the game. More annoying than scary, but definitely a good reason to avoid the witch. It’s not always possible to avoid her, though, and it can get a bit frustrating, having to learn all her potential appearances. What else happens in the woodcutter’s cottage? Well, you can get revenge for that whole Garden of Eden débâcle by choking a snake to death with an apple. “What a good shot you are.” says the game afterwards, and it’s hard not to read it in a condescending voice. Eventually I found the witch’s hidden broomstick, which revealed the location of dear, sweet Esther. Esther has a skull for a face. That can happen when you’re locked up by a witch for too long, I hear. The King and Queen just wanted their kids back, they didn’t specific that they had to come back without looking like a very dedicated Skeletor cosplayer, so my work here is done. Now we’re sent back to the first screen of the mountains, but with the password we just acquired we can move on to the next area: the giant’s garden. Oh wait, there is a garden in this game. It’s just really big. So big it becomes, like, a forest or something. I’m glad I’m being told that this is a talking toadstool. I might not have figured it out on my own, it looks more like a burger bun. The talking toadstool uses its incredible powers of speech to fill you in on this area’s objective: reach the other side of the giant's garden. There will be obstacles along the way, but by selecting the correct insect helper from the on-screen list you can avoid the danger. You start on the edge of a pond, so the obvious choice is to use the butterfly to fly across, right? That is indeed the correct solution. If you’re wondering how a butterfly manages to carry a person, don’t forget we’re in a giant’s garden and this is presumably a giant butterfly. It’s the size of a pterodactyl, drinking gallons of nectar through a proboscis like an oil derrick. Personally, the thought of that is creepier than any amount of witches. Granny’s Garden also offers the potential for immature giggling during scenes like this one, where your character is plagued by nut problems. “The nuts are hurting you” it says, as though you’ve been embarrassingly outplayed in an online shooter and now xX_ELiTE-SNiPaH420_Xx is teabagging your prone body. The obvious solution here is to crawl inside the giant snail’s shell and let that protect you from the falling nuts, and for the most part the solutions are pretty obvious and it’s not like there are many options to chose from. Make the wrong choice too many times and the witch will get you, but it doesn’t take long to get back to this point so it’s not as frustrating as it could have been. Other solutions include climbing a tree with the help of a spider, having the worm tunnel underground to avoid an army of ants and enlisting this frankly terrifying bee to get rid of the giant’s guard dog. It looks more like a face peering through a toilet seat than a bee and I’m sure you’ll agree that looking into a dark toilet only to see a faintly pleased-looking face staring back at you is the stuff of which nightmares are made. 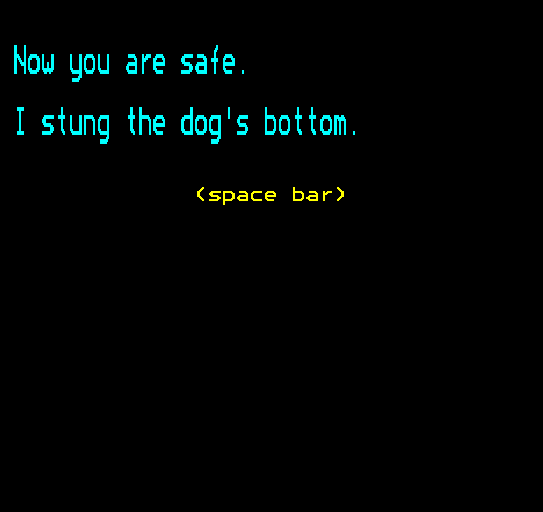 But how does the bee defeat the dog? It stings the dog right on the arse. Good job, bee. Now please leave and return to your hive, a colossal, skyscraper-sized edifice where tens of thousands of your fellow “bees” huddle together and await the coming of your true master. 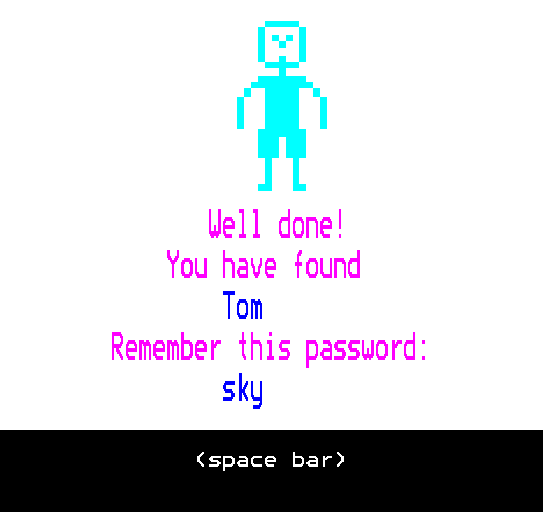 Having used the spider to reach the top of the tree, we find Tom and the password for the second half of the game. Unlike his sister Esther, Tom does not have a skull for a face. Instead, his head is shaped like a three-prong plug. Moving on to the next area now, and it’s the City of Dragons. I really like the way this place looks. Obviously Granny’s Garden’s graphic are so primitive they haven’t even discovered the basic concepts of irrigation and farming yet, but there is something very charming about their extreme blockiness. I think part of the appeal is that they remind me of the sadly-missed Teletext service – and it comes as no surprise to learn that the BBC Micro could indeed be set up to receive Teletext and that’s basically the exact same thing as having the World Wide Web on your home computer, if the internet was made of cinema listings, football scores and Duplo blocks. Guarding the City of Dragons is Ah-Choo, a little red gremlin who reminds me a bit of an angry tulip. Before he’ll let you enter the city, you must answer Ah-Choo’s question: what is your favourite food? Obviously I gave this some long, serious consideration before answering with the most immature thing I could think of. Well, you didn’t inherit that particular allergy from your mum, Ah-Choo. Ooh, burn. The next segment is all about dragon-wrangling. Two of the royal children are trapped in Dragon City, guarded by these baby dragons. To neutralise the dragons, you have to slip one of your magic dragon-taming collars around their necks, but that’s not as simple as it sounds. 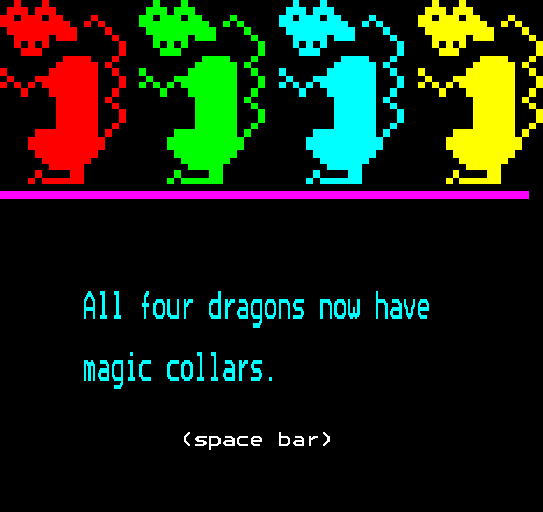 You can only collar one dragon at a time, and you have to get it alone because, I dunno, if there’s more than one dragon on-screen it’ll come to the aid of its sibling? I think that’s the implication. So, you need to lure the dragons into a position of solitary vulnerability before you strike, and the way to do that is with food. This is surprisingly difficult for me to convey succinctly, but here goes. You have four different types of food: chips, buns, lollies and oranges. 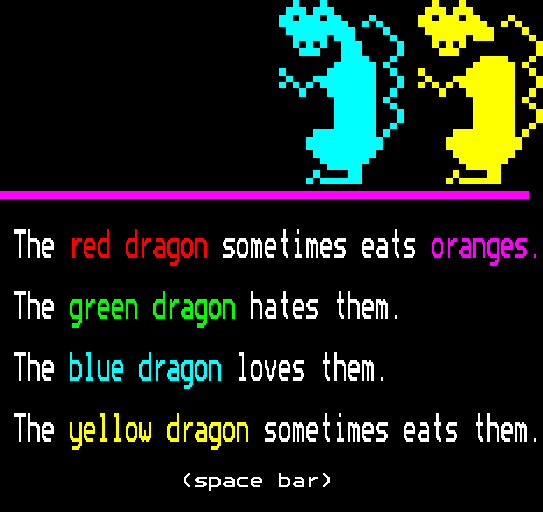 You throw one type of food to the dragons, and they’ll respond depending on how much they like said food. One of them loves it, two of them are indifferent and one hates it. For example, the blue dragons is a real oddball who hates chips. What kind of maniac hates chips? You’re weird, blue dragon. The goal is to get one dragon out at a time so you can chuck a collar on it, with the educational goal being (presumably) that the kids try out different foods and write a little matrix recording which dragon likes oranges and which hate buns. Again, who hates buns? “Bun” is such a wide spectrum of baked confection that surely everyone must like some kind of bun. But I digress. It’s a pretty simple concept, although the slightly random nature of it does mean it can take longer to complete than you might think and you’ve only got three of each food item: use them up and the witch comes along and casts her now-familiar “game over” spell on the player. 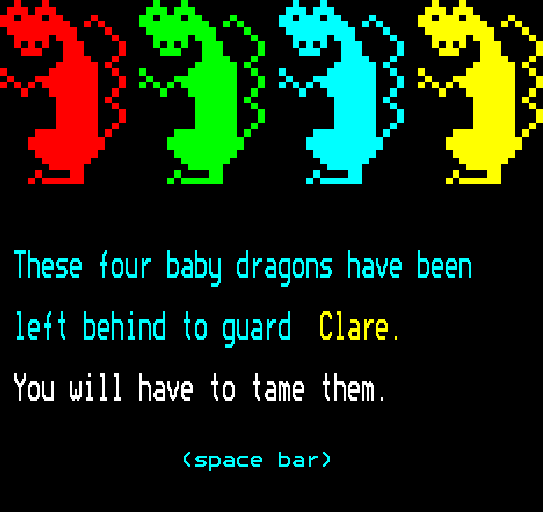 Once all four dragons are tamed, Clare and Anna are rescued. It seems that skull-faced-ness is a family trait after all. Now we’ve reached the final chapter – that Land of Mystery. How mysterious! The last two royal abductees are hidden somewhere nearby, and you’re tasked with finding them by visiting the various locations and figuring out exactly what the hell is going on. For instance, if you travel to the cottage, you’ll run into the witch again. Imminent danger hangs thick in the air, but the witch is holding a delicious cake, so what are you to do? Given that every other encounter with the witch has ended with a game over, you might be thinking that the best course of action is to leave her the hell alone. Yes, that’s what you’d think. Instead you have to walk over and take the cake out of her hands, which you can do with no repercussions for… some reason. That’s not the greatest piece of design consistency, is it? The antagonistic witch who has plagued the rest of your adventure is suddenly doling out free cake. It’s not even like it’s an apology cake, with “Sorry For Foiling Your Plans” iced on the top either, because later in this very stage the witch will hunt you down. Or how about this area, where (as far as I can tell) the only way to progress is to tell a hungry giant that you want him to eat you. That might be your kink, buddy, but it hardly feels appropriate for a kid’s educational adventure game. Certain pathways are guarded by strange creatures, like this one. Nice boots, pal. They’ve all got some kind of question or request for you. 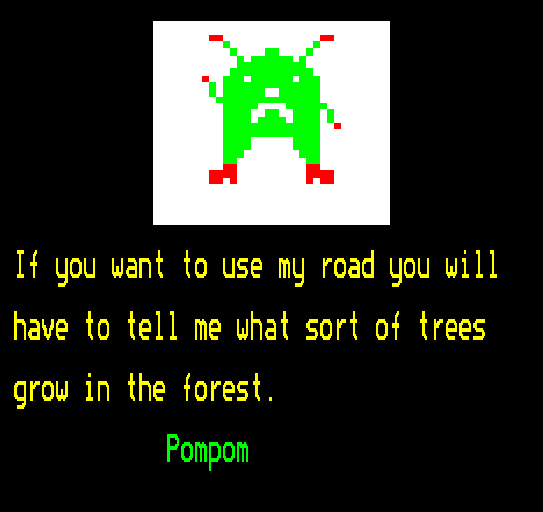 For instance, this one won’t let you pass until you’ve been to the forest and found out what kind of trees grow there. Also the forest is on fire, so you need to go to the lake and get some water to put it out. 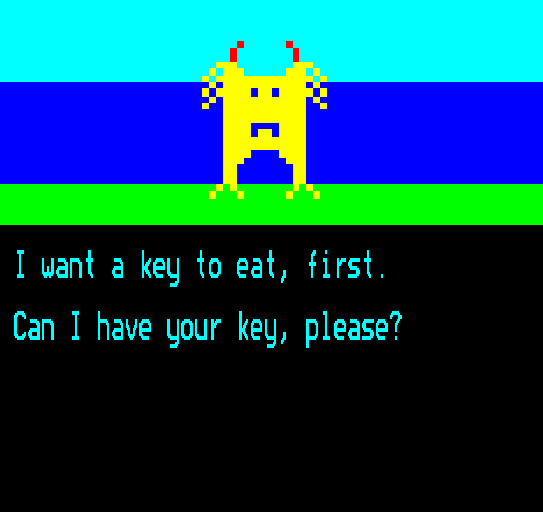 At the lake is this yellow gremlinoid, who has the weird request that you feed it a key. Like an idiot, I agreed, only to realise moments later that I probably should have used that key to unlock a door or something. And so I became stuck then I reached the Castle of Dreams and couldn’t open the sodding door because some sad-faced creature that looked like a bundle of wheat stalks thought a key would make an appropriate snack. I was genuinely surprised that there was no “hey kids, don’t try eating your front door key at home” warning. The trick is to go to the Castle of Dreams first, unlock the door and then feed the key to the monster. This whole section has a lot of trial-and-error about it, but I think that’s kinda the point. Kids were supposed to be writing down what was going on and using that information to get through the various puzzles, and each part of the game was intended to spark classroom discussion about the themes encountered therein, like coordinates, insect life and not eating keys. 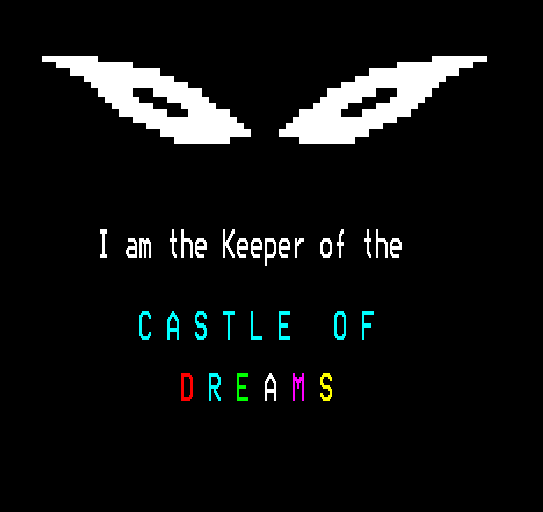 As for the Castle of Dreams itself, that’s where Granny’s Garden reaches the apogee of its weirdness – it’s nothing but a bizarre series of glitchy images where the games sprites overlap and change colours for a minute or so, filling the screen with a retina-searing wave of primary colours and vaguely unsettling imagery. When you see scenes like this it’s hardly surprising that some people say Granny’s Garden creeped them out for years afterwards. Once you’re endured the hallucinatory excess of the Castle of Dreams, you find young Daniel waiting for you somewhere near the back, probably cowering in a corner and vowing never to fall asleep again. After that, you can feed the key to the creature, get some water, put out the forest fire and find the last child inside a ruined tower. 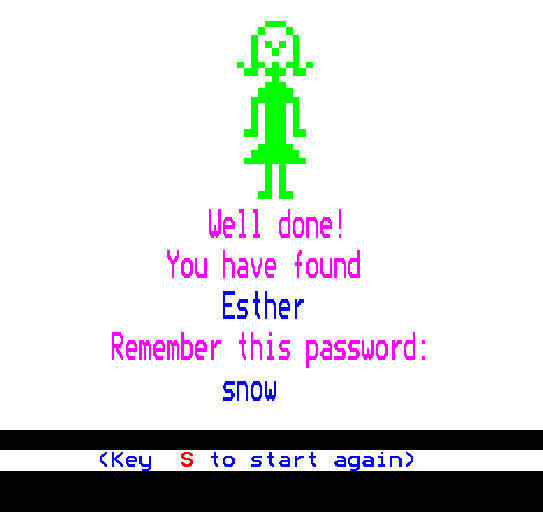 Congratulations, Granny’s Garden is complete and you’ve experienced one of the most foundational works in the history of British home computers (educational sub-division). As a game there’s not much to it and it can be a bit obtuse, but there’s something totally captivating about its weirdness, hailing as it does from a time before the “rules” of what educational programs and even computer games were supposed to be like were codified. 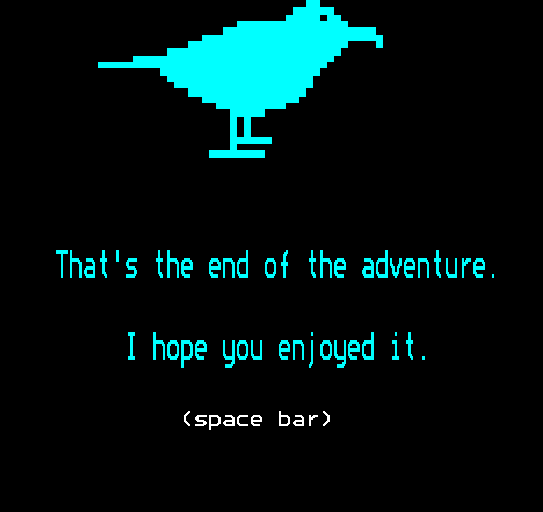 I know I’m glad to see the end of it, because I don’t think I ever finished it as a kid. I would have remembered the Castle of Dreams, possibly when waking up at 2am drenched in fear-sweat. It was definitely an interesting experience, even if, looking back on it, I don’t think you’re likely to learn much from it beyond the basic concepts of actually using a computer. But I suppose that was the point, wasn’t it? I made my own visual novel called A Light Inside! Italian Ghostbusting guessing-game Ghost and Booster! Unreleased ninja action in Hangzo! Right on! Do PODD next! Man, now *there's* a game I haven't seen in a while! "Do you want to go into the cave?" You're not wrong, Granny's Garden makes sure you know damn well who's in charge. Congratulations on resisting the urge to mention what the negative space created by the witches mouth looks like. You are a stronger man than most. I honestly didn;t notice. Is this... maturity?! that certainly brought back some memories, I'd blanked out the crazy castle of dreams psyche out. I remember telling the gremlin guy my favourite food was ashit, making him say "whenever I have ashit I start to sneeze" ho ho 7 year old me was on form back then. 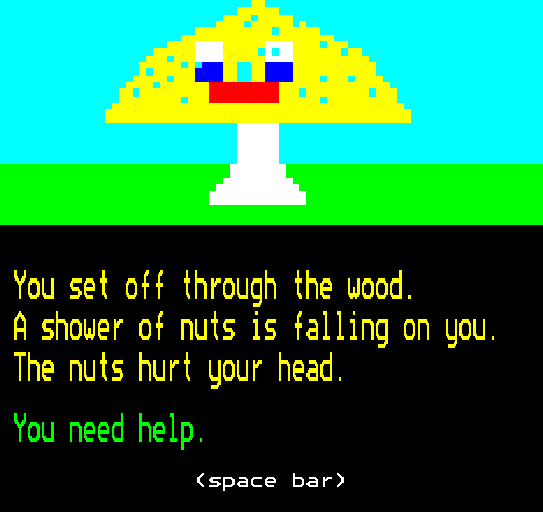 God bless you bbc micro and your enormous discs. Ha ha, that's a good choice of favourite food for that guy. That was all sorts of quirky until the Castle of Dreams bit. Yume Nikki called, it wants its aesthetic back. 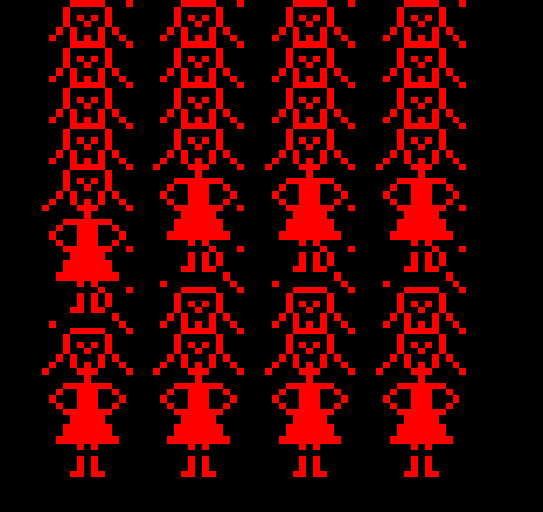 I'd love to believe that the creator of Yume Nikki had played Granny's Garden and took some inspiration from it. Mmm, yes. I remember, the excitement of getting to have 20 minutes on Grannies Garden as the teacher tried to wrangle with 30-odd children all desperate for a go. All those times we played it and I don't think I ever got as far as the second half of the game. Still traumatised after all these years.